As the old saying goes, one man’s trash is another man’s treasure. Or not. In the case of Song Dong’s installation, Waste Not, the magic of transubstantiation has failed to take place. Despite all the hype, this trash is still just trash. 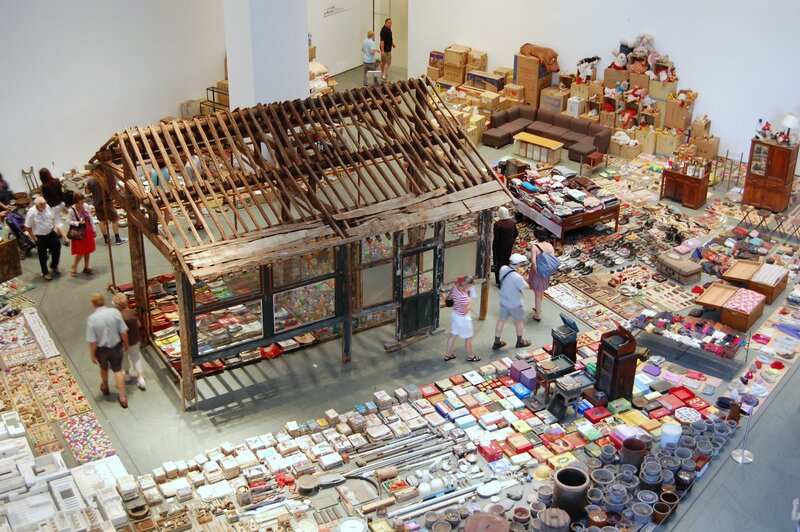 Song Dong presents a vast array of seemingly random objects, collected by his Mother, over five decades. The objects are utterly, repetitively, mundane: old flowerpots, plastic bottles, shopping bags, stuffed toys, mended clothes, clocks et.al. (Even writing the list is rather dull.) This domestic detritus is arranged into neat (if not clean) patterns by genus, but it takes more than a spot of taxonomy to turn trash into treasure. Or even art. Song Dong claims that the installation was an attempt to collaborate with his mother; a strategy designed to alleviate her grief following the death of her husband. I admit that it seems churlish to be so unimpressed by such a noble, selfless gesture. But inadvertently (? ), the artist has also exposed not only his Mother’s grief to the world, but also her eccentricity. Is this a selfless act? He claims her “collection” is a legacy of hard times: waste not, want not, as another old saying goes. But there is a fine line between miserliness and madness. Mending and recycling are frugal and practical. That old piece of string may indeed be useful one day. Hoarding is a bulky manifestation of obsession. No one is ever going to need that much stuff. The exhibition wall text and all the press coverage make sure to mention that there are over 10,000 objects on display. As if sheer scale is enough to be impressive. As if quantity, in and of itself, is interesting. It isn’t. But it does beg the question: Where did Song Dong’s Mother keep all that stuff for five decades? The structure in the installation, which is apparently part of the ancestral home, is not nearly large enough. As well as being an obsessive collector is she also in possession of a Tardis? Now that is interesting. Song Dong: Waste Not is on at Carriageworks until March 17, 2013.